It’s hard to believe that a team with four playoff seasons in 41 has anything to “step back” from. It’s that sour history that makes tanking so incredible here. One of the more intriguing observations about CF Jarred Kelenic, said to be the prize in the Mariners’ inefficient trade with the New York Mets that required sacrificing All-Star closer Edwin Diaz in order to dump Robinson Cano and his contract, is his birth year of 1999. That means he would have no recall of the 2001 regular season, the last time the Mariners were in the playoffs. To him, it is history unlived, a sterile artifact as is World War I to everyone today. The startling sequence of moves the past four days directed by general manager Jerry Dipoto to a far-off, nebulous end, evokes wonder as to whether Kelenic and his generation are any more likely to see a World Series in Seattle than the dwindling generation of fans who were around for the expansion season of 1977. Those fans are 0-for-almost-a-half-century. How can a franchise take a step back from nearly nothing? Generations have seen how that worked for Wile E. Coyote and his relationship with desert cliffs. Those of us old enough to recall that out-of-body, 116-win season of 2001 may reasonably wonder, in hindsight, whether it drained entirely all the wits, soul, protoplasm and karma from the franchise. The Mariners Monday completed their third trade of top talent in four days, this time sending SS Jean Segura and relievers Juan Nicasio and James Pazos to the Phillies for 1B Carlos Santana, 32, and SS J.P. Crawford, 24 next month. Earlier Monday they concluded a simmering blockbuster, unloading Cano, All-Star reliever Edwin Diaz and $20 million cash to the Mets for Kelenic, OF Jay Bruce, 31, RHP Anthony Swarzak, 33, RHP Gerson Bautista, 23, and RHP Justin Dunn, 23. Friday the Mariners traded righty reliever Alex Colome to the Chicago White Sox for C Omar Narváez, 26. The speed and breadth of the moves is daunting. Unprecedented in Mariners history — there have been few teams of 89-plus wins to dismantle — and rare in baseball, Dipoto swapped out much of the Mariners’ contributing talent for a couple of journeymen veterans (Bruce and Santana) and a journeyman reliever (Swarzak) who pitched 26 innings last season for the Mets (his sixth MLB team) and some kids whose potentials vary from intriguing to pedestrian. The deals followed the earlier trades of their best pitcher, James Paxton, and the organization’s only real MLB catcher, Mike Zunino, for prospects. At ground level, the needs to unload Cano’s remaining $120 million salary and to replenish the bankrupt farm system make the frenzy broadly understandable. And since evaluating from a distance prospects mostly without much time in the majors is futile, I will leave that to the good folks at Fangraphs. To take the view up to 30,000 feet reduces matters to a single question: Do you trust this regime to have made the right decisions? I have a two-word snark of an answer: Dan Vogelbach, the definition of a 4A player — .616 OPS with the Mariners, .837 OPS in eight minor league seasons. That is, of course, unfair, because all GMs have several Vogelbachs on their resumes. What is fair is that Dipoto had to know when he took the Seattle job three years ago that he couldn’t have many misses because he knew how bad the Mariners’ system was from competing against it with the Angels. He had heard all the industry snickers about Seattle. But for Vogelbach, almost strictly a DH, he gave away a versatile, solid major league pitcher, Mike Montgomery, who helped the Cubs win a World Series for the first time since the Great Permian Extinction. Certainly Dipoto has made some good acquisitions, but his frenetic churn of the organizational roster — here’s a blog post that reviews many of the larger deals — failed to advance the franchise fast enough to avoid a fate that he seemed so dead-set against: Tanking. From a consumer standpoint — and that includes not just fans, but advertisers, sponsors, media partners and politicians from which they recently sought favors — he is telling all that the Mariners will be non-competitive in 2019, 2020 and maybe beyond. Even though other MLB teams have followed a similar strategy, the ask for indulgence in this market is huge because the history is so pathetic. These dubious developments don’t directly impact MLB player personnel decisions. But the decision to tank is a massive one that will strike all corners of the organization, which didn’t seem to be doing well before it said goodbye to 2019 before it said hello. That could well be true. But it was so far back on the road that the distance was measured in time zones. Getting a buy-in for sports tanking is an onerous task, one always made easier with public credibility. Perhaps Dipoto can trade for some. Fantastic article, Art. Thanks. I still agree with Dipoto’s tactics – these trades have been terrific for the 2020/2021 team and this past year was a fluky, lucky season (and we still didn’t make a one-game playoff). I see more trades coming next week during the winter meetings. And who knows, maybe Felix wakes up and learns to master a knuckleball, which I think is his only way of being, at most, relevant. But the best part of the article is the organizational callousness – especially the $135 million taken away from the homeless. Oh, and don’t forget the Mariners’ infamous Keds-dragging-in-the-sand attitude toward the SoDo arena and the street vacation. I understand how Dipoto made the decision to tank, and I’m sure some of the prospects will pan out. But 41 years, fercripesakes . . .
“It said goodbye to 2019 before it said hello”. Excellent summary line, Art. Sure am glad I’m not a Mariners telemarketer trying to sell the upcoming season on commission. “Yessir, Mr. Johnson, the season will be just great…who’s playing short? Kid from Sequim we’re high on…”. Somebody’s high on somethin’. First 10,000 fans to each game get a fish tank. Art, Correct me if I’m wrong, given the tons of payroll they jut shed, isn’t it possible the M’s may pick up some free agents as well? Starting pitching for example. Not this offseason. They still have a payroll of $140M, and it’s foolish to spend money on FAs when the plan is to lose. It’s been mentioned by others, but stonewalling the Sonics arena was another horrifically bad look that anyone who has a modicum of common sense would see from a mile away. They’re the MLB Cleveland Browns. They even have their own version of Joe Thomas in Felix Hernandez. Seattle lost the wrong franchise. Lincoln’s strident opposition was indeed a black eye. They finally rolled back and let the port bully the council. They have greater experience. At first I didn’t like all the moves being done but decided that nothing else has worked the past 41 years so why not? The biggest weakness of the Mariners has been there is nothing down in the farm to help out when the active roster has an injury or if a player needs to be motivated to perform. I hate, hate, hate seeing Diaz go but history has shown when a closer has an amazing season they have a big drop off. I still think Cano has it. Zunino and Cruz (who I’m assuming will be let go) are rare positive clubhouse presences. It wouldn’t surprise me if Heredia becomes the next Chris Taylor. With Colome gone there’s no closer now and they’ve gone from Colome to column B with Omar Navarez. With Segura gone Haniger, Seager, Healy and the pitching rotation should be on notice. Props to Dipoto for having the courage to dismantle an 89 win team that just didn’t seem like the kind of club that could build on that and become a contender. 2022 can’t come soon enough. The farm weakness has been there for years preceding Dipoto. Amazing amount of bad drafts. Regarding the tear-down, I have a hard time shrugging throwing away seasons. You may have problems shrugging away seasons but quite frankly, what was the alternative? I personally feel that he did a good job with what he had in the minor leagues to trade with given the limitations of the front office. But there was no way we were going to be competitive next year and beyond without a tear down. One would have to believe 2018 should have been a 92 win season with another 75+ games from Cano. Spilt milk. The parallel management influence of Ichiro is past. Has anyone checked Seager’s eye sight? Maybe he needs a prescription change. Give us some likable teachable players and go easy on the freak show. This could turn into a really nasty division if the Angels get tough. The main reason they won 89 was the dominance of Diaz. He’s gone now. Was he part or your freak show? The Adam Jones Debacle is a perfect illustration of the history of the Mariners. Trade away a young superstar in the making (along with additional prospects) for one Pitcher who never panned out. None of this is DiPoto’s fault, nor did he saddle the team with the Hernandez and Cano contracts. I think one of the truly remarkable aspects of all this is that he likely knew well what was necessary a few years back, and took the job anyway. He is either an exceptionally confident and smart GM, or a total fool. I guess we’ll see which in the coming years. Seattle traded Jones and Chris Tillman for Erik Bedard (others were involved). Jones became not a superstar, but a very solid player for years. Bedard was fragile, gave out after 4 1/3 innings, and not liked in the clubhouse. So what did the M’s do? They re-signed him TWICE as a free agent. That, and Heathcliffe Slocum may be the two worst trades in franchise history….BUT, they did acquire Jamie Moyer. I have been a Mariners fan since Day One, and the Pilots and Rainiers before that. Other than the Pilots parking the truck and awaiting instructions, this may be the nadir. More shedding may come next week, and their 2019 payroll will still be atmospheric. The Orioles (with Adam Jones) won 49 games last year, a number the M’s may not exceed. I, for one, would like to hear from John Stanton and have him explain the plan to wheel out Ichiro in Japan in March, and King Felix in April. As an older American, I do not have much time left to fulfill my lifetime hope of seeing a Seattle team in the World Series. Remember when Danny Kaye said to get your World Series tickets early? It’s just so HARD to follow this team. Even Ken Griffey Junior made a mess of things when he left, and then did it again. Dave Niehaus died. Unlike the Cubs, they have not been loveable losers. Unlike the Red Sox, they have not been DNA infused into our bloodstream. I wear my Mariners cap like an anvil around my neck. I’d have a lot more faith in Dipoto if he’d come in and done the tear-down immediately when he got here (like Carroll and Schneider did with the Seahawks). The problems with the current team and farm system already existed at that time and have only grown worse. But he must have thought, with a few tweaks, he could get a playoff appearance and hold the fans at bey. But the well was already dry. Last season was never real (see Run Differential). After 17 (18? I lost count) years of sliding sideways, here’s to finally trying to create something real. After all, the first step solving a problem is admitting you have one. And this goes for the entire organization, not just the ball club. The question you pose, Art, “Mariners Take a Step back? From What?” is really appropriate. If they take any more backward steps they will fall off the edge of the earth. We will be watching a bunch of “prospects” and newly acquired over-the-hill veterans (Bruce, Swarzak), but still have to pay very high ticket prices. They should lower ticket prices to reflect the AAA level of play (at least from Mariner side) but we all know that will never happen. 18,000 fans in the seats must be enough to ensure profit. Only I think we may have a Cleveland redo with 5,000 mostly drunk butts in the seats on some nights. Management has no one to blame but themselves. I am tired of seeing former Mariners making good elsewhere…..lest we forget losing Vizquel, Big Papi Ortiz, Varitek, Lowe, Cabrera…. all with long solid careers elsewhere with nearly nothing in return. Even the Jay Buhner trade for Ken Phelps was a happy accident. Michael Saunders and Justin Smoak have been to the All Star game post Mariners career. Chris Taylor was named NLCS MVP. And then there’s Adam Jones and Chris Tillman. And the price of tickets will be . . . . ? Great deals on authentic MLB player jerseys now available at the Mariner’s store. Don’t miss out. I just picked up a Tuffy Gosewisch jersey in mint condition for almost nothing. Get’em while they last. Please tell me again Art how John Stanton is any different from most of the past ne’er-do-well owners of the Seattle Mariners. Billionaires make their money these days by looting the organizations they own, bankrupting them and opening up the next day, debt free, in a foreign county. The Tokyo Mariners may may be the first Asian ball club in the American League. What’s wrong with the name Mariners? Well, as I said, it’s cursed. It’s also 3 syllables, which always sounds clunky and is too much of a mouthful for a sports team. It sounds bad when you chant it. It has no firm sounding letters at the beginning of the syllables, which makes it sound soft. It has no pizazz or punch, that is, neither excites the home crowd nor does it scare the opposing team. It has no alliteration. It has no good abbreviation (M’s…..ugh). It’s not a word actively used in the modern world (when was the last time you used the word “mariners” outside of the baseball team). So far, I’m the only one in this parade. But I’ll keep beating my drum. Anybody have a better explanation for their futility? Yep. The worst ownership group in the history of sports, and an upper management of Lincoln, Armstrong and Zduriencik (or whichever yes man lackey that preceded him.) Clueless all. Almost anybody reading the article could have done a better job. 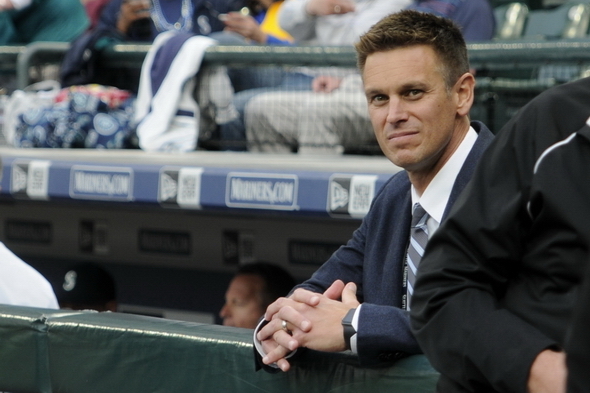 Mr. DiPoto’s rapturous initial praise of Dr. Martin as someone who would revolutionize the M’s health, strength, and performance makes one wonder if he’s ultimately a very foolish optimist who sees the world through rose-colored glasses. I’m all for optimism if it’s grounded in clear-eyed vision, research and hard work (see: Carroll, Peter). Prediction for 2019: Kyle Seager will have a major comeback, whether it’s here or elsewhere. Big contract, yes, but it’s silly to talk about him in the same “old and in the way” way as Cano and Felix; he’s only 30.